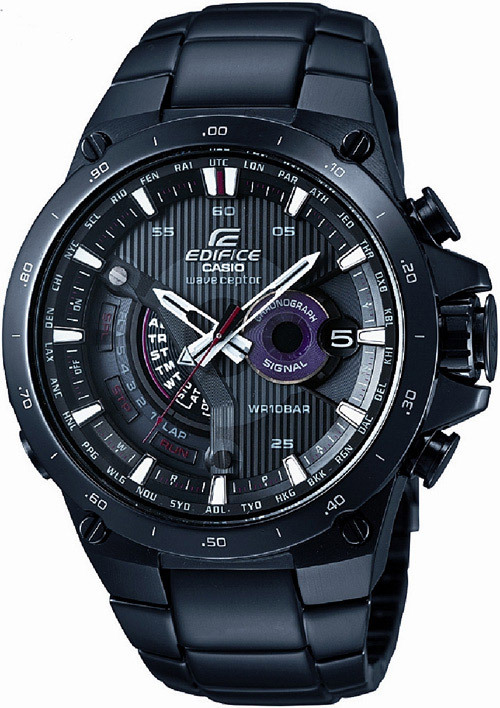 Casio has added another signature timepiece to its luxury EDIFICE Black Label collection. The new model, codenamed EQW-A1000DC-1A features 3D face with purple and white accents and is outfitted with solar atomic timekeeping. It has a dual-layer chronograph with Casio’s Smart Access feature that permits easier, more sensitive operation of multiple functions by combining independent hand movement, made possible by the new 5-motor layout, with electronic crown-controlled switching. The watch is made from a solid stainless steel black IP case and highlighted by an anodized aluminum bezel. It has a large disk indicator installed in the cut-out between the upper and lower dials rotates to allow quick confirmation of the current mode. Other features included in this stylish models are Self-Charging and Tough Solar Power Technology which combines solar panel with a large-capacity rechargeable battery, Multi-Band 6 Atomic Timekeeping, Countdown Timer, Full Auto-Calendar, World Time as well as 100M water resistant. The EQW-A1000DC-1A will be available this summer for an MSRP of $750.